Here goes the third post in my series of how to play all 14 Ultima games on a modern PC. Again, for this post I won’t get into acquiring the game files, installing DOSBox or justifying why do this myself when I could just get the games via GOG. Please see my first post, on Akalabeth, for my comments on those things. Go here for previous games I have covered: Ultima I. So here goes how to play Ultima II on a modern PC. As always, the key acquisition for all Ultima games is the provided map. The best place to get most of these is from the High-Resolution Ultima Map Project. 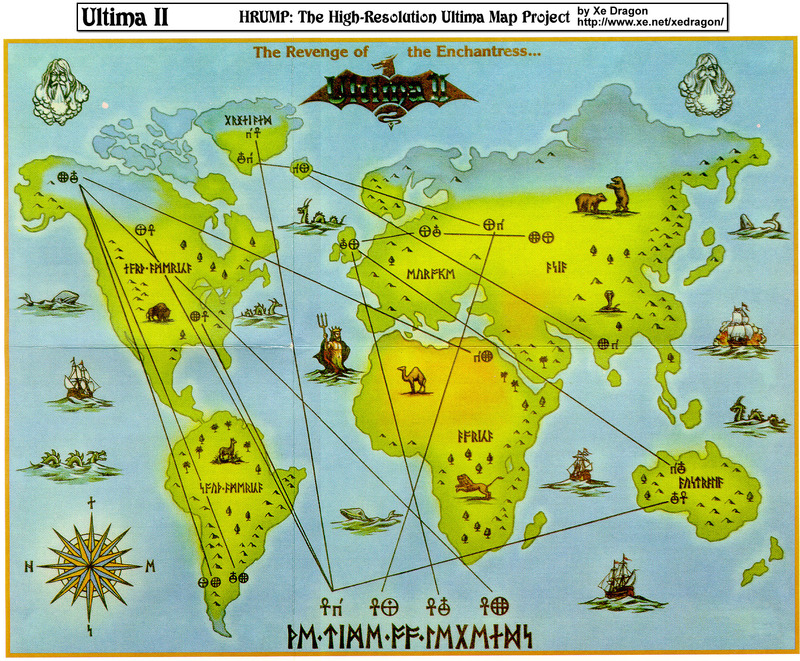 Here is the link for the Ultima II map. Next is the manual. I have ever found a scan of an actual original manual for the DOS version of Ultima II. The options on the internet are pretty much the Apple II version or this, which is a fan recreation of the of the Ultima II manual and Quick Reference Card for MS-DOS. Again, this is simple. Copy all the game files to your machine. Choosing a path that only contains folders with less than 8 characters and contains no spaces will make your life easier in the next step. For reference, I always choose “C:\Games\ultima2”. At minimum you need Moonstone Dragon’s Galactic Patch. However, lets hold off a second. We will come back to this in a minute. Hit Control-F11 until the cycles is ~500 (again what ever feels right). Again control-F12 increases the cycles and Alt-Enter puts DOSBox into fullscreen mode. Have you thrown up in your mouth yet? Purple and cyan, oh how I do not miss 4 color CGA graphics. So now you need to make a choice. There is a graphics upgrade patch for Ultima II. Behold all of its majesty…. So what is the plan? Some would make a purity argument that you should play it as it was intended, blah, blah. To that I would say “Go play it on the Commodore 64 then! It looks a hell of a lot better than CGA graphics!” Since I am a nice guy I will walk through both choices. I swear, I am not judging you. Here goes. Download the patch I linked above: Moonstone Dragon’s Galactic Patch. Copy the contents of the zip file into C:\games\ultima2. Fire up DOSBox and run the following. Ok you should be good to go. You do not need to run rengal or u2patch ever again. You just need to run the ultimaii executable. If your eyes start bleeding, remember I warned you! The graphics upgrade includes the Galactic Patch, so there is no need to install it. Download the graphics patch from here. Copy the contents of the zip file into C:\games\ultima2. Choose “replace” if it asks. Double-click u2upw or u2upw.exe in C:\games\ultima2. There is a really good chance Windows is going to throw up a window letting you know this executable may be dangerous. To get around it hit the “More Info” text on the dialog and then a “Run Anyways” button will appear. Once launched hit ‘Enter’ to get past the README, ‘Y’ to apply the upgrade and ‘S’ to save the default configuration. Now execute the following in DOSBox. Again, you should be good to go. You do not need to execute u2upw.exe ever again. Another advantage of this method is you do not need to manually adjust the CPU cycles, it just runs at the default 3000. Now to summarize when you want to play the game from now on, just do one of the following based on what patching/upgrade strategy you went with above. If you went the minimal patching approach execute the following in DOSBox. If you went with the graphics upgrade execute the following in DOSBox.